Congratulations Blue Mustangs! 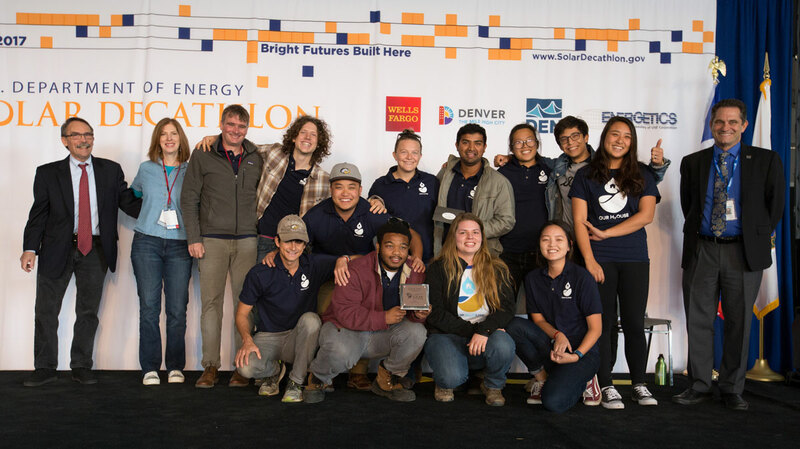 The University of California, Davis is proud to have participated for a second time in the US Department of Energy’s Solar Decathlon competition beginning during September and October 2017 in Denver, Colorado. This rigorous competition challenges collegiate teams to design, build, and operate a solar-powered house that showcases cost effectiveness, energy-efficiency, and attractiveness. Pursuing this opportunity with a multidisciplinary approach provides training that prepares UC Davis students for the clean energy workforce. California endures a 5th year of record-breaking drought that has created a parched landscape and a scope of challenges never before faced in the state. Our H2Ouse (pronounced “our house”), focuses on cutting a water use in a typical residence by half while maintaining the same level of comfort at an affordable price point. Energy and water usage feedback displays and systems enable residents to manage their own private oasis where they are the authors of their own conservation experience. Taking a systems approach to this reduction is just the first step, however. True reduction lies in the hands of the residents and those in the surrounding community. Multiple elements in Our H2Ouse inform the occupants about usage and consequence while giving them a unique opportunity to allow an over-stressed environment to regenerate itself. True sustainability is not reflected on the label of something bought at the store. It starts at home. Our home.